The clarified fat portion of milk, cream, or butter obtained by the removal of the nonfat constituent. It contains not less than 99.7% milkfat, not more than 0.2% moisture, and not more than 0.05% milk solids nonfat. It is used in frozen desserts,puddings, and syrups. It is also termed anhydrous milkfat, or ghee. 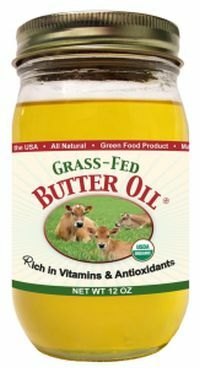 Butter oil or high vitamin butter oil is dairy oil extracted without heat from cows fed solely rapidly growing grass. It is more nutrient dense than standard butter from grass-fed cows and less processed than ghee. Butteroil possesses a light yellow colour and has a clean bland taste, free from sour, bitter, rancid, oxidized or other objectionable flavours. Intense heat treatment is not used in the manufacturing process. Consequently, butteroil lacks heated butter flavours. In the dairy products industry, it is used for recombination with skimmed milk powder to produce liquid milk and other milk products. Lecithin in butteroil is used to produce instant milk powder. In baking, butteroil can be sprayed on cracker surfaces to enhance gloss and appearance. It is also used in the chocolate manufacturing industry. Ease of melting, pumping and mixing with other food ingredients. Butteroil is also available in a lipolyzed form, having been modified enzymatically by lipases to produce a concentrated source of creamy and buttery flavours for use in bakery, low-fat and low-calorie caramel food products. Powders of spray-dried butteroil encapsulated in sugar or flour are used as food ingredients in bakery, confectionery and ice cream manufacture. Butter oil is a nutrient dense supplement containing high amounts of Activator X, the fat-soluble vitamin K2. Vitamin K2 is linked to heart health, cancer prevention, healthy skin and bones, and proper growth and development. Vitamin K2 works synergistically with Vitamins A & D to support a healthy immune system. High in CLA's, conjugated linoleic acids, which promote healthy weight by contributing to the reduction of body fat and increase in lean muscle tissueAccording to Dr. Weston A. Price, who discovered butter oil in the 1930's, high vitamin butter oil has its most potent health impact when combined with cod liver oil. In fact, before going to have a cavity filled by your dentist, look into the remineralization studies on cod liver oil combined with high-vitamin butter oil!